The names of Crosby, Stills and Nash are synonymous with harmony, political activism and the excesses of rock n’ roll stardom. 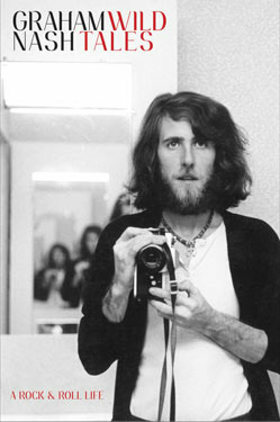 And in Graham Nash's new book, Wild Tales – A Rock & Roll Life we get an inside view on how these three elements intertwined to form one of the most compelling stories of survival ever to come out of the music industry. From humble beginnings in Manchester to the dizzying heights of the California rock scene, Nash takes us on a journey that encompasses fame, jealousy, good times, bad times, drugs – oh so many drugs – and everything in between. Wild tales indeed. But more than that, the book allows us to see how this acclaimed singer/songwriter – awarded an OBE and twice inducted into the Rock and Roll Hall of Fame – slowly became aware of the issues facing his generation in the 1960s and went on to become one of the leaders in celebrity activism. It was while a member of The Hollies – which he formed with his friend Allan Clarke – that Graham Nash first tuned in and turned on to the causes affecting the world. 1965 saw the release of his first song addressing social change – Too Many People was in answer to the Mau Mau uprising in Kenya and a far cry from The Hollies’ bubbly pop. But it opened his eyes to the possibilities of using music as a tool for change. And it is a tool he has wielded for the last few decades, using his voice to make sure the people are heard. Whether it is with his bandmates David Crosby, Stephen Stills and Neil Young or solo, Graham Nash ensures he makes the world a better place for those without voices. In 1979 – following the nuclear meltdown on Three Mile Island – Nash joined with Jackson Browne, Bonnie Raitt and John Hall to form Musicians United for Safe Energy (MUSE). After organizing a series of No Nukes concerts at Madison Square Garden that featured Bruce Springsteen, James Taylor, Carly Simon and more, the MUSE musicians went on to join The Guacamole Fund, a charity that helps coordinate events for organizations that work in the public interest. They have been behind over 1,200 cultural, educational, environmental, social change and service events since 1973. We may all be aware of environmental issues today, but it was the groundbreaking work of these musicians in the 1970s who brought the cause to the public arena. What was hushed up and swept under the mat was suddenly lit up in bright lights. And they didn’t stop there. Crosby, Stills and Nash never shied away from playing benefit concerts to shine a light on the issues affecting their fans. Homelessness, drug education, the fall of the Berlin Wall, Greenpeace, Farm Aid, the Bridge School, the California Environmental Protection Initiative, UNICEF – the list is never-ending. Graham Nash and David Crosby even joined the Occupy Wall Street movement in 2012. Wild Tales is more than just a book about music. It is about how music can change a generation. This is Graham Nash stripped bare and unplugged. It is no-holds-barred and not for the faint-hearted. More than anything else, it makes you wish you were there. Wild Tales by Graham Nash is available at Amazon.com and Amazon.co.uk.